In her years of working with the International Center for Transitional Justice (ICTJ), Kelli Muddell has learned how often responses to mass violence mirror the gendered power imbalances within societies, thereby replicating these imbalances. Over and over again, attempts to develop gender-sensitive approaches are thwarted by a lack of inclusion of the very populations who are most in need of transitional justice. How could ICTJ address this problem? The product of years of reflecting on this question is the Gender Modules, an interactive curriculum that aids users in exploring strategies used by women and victims of sexual and gender-based violence to engage with transitional justice processes. It seeks to take decisions about gender-sensitive approaches out of the hands of a few experts or organizations and place it where it belongs: in the hands of civil society and persons seeking to develop agendas and mobilize around women’s and gender rights. The first of its kind and the culmination of three years of planning and development, the comprehensive curriculum uses case studies to illustrate topics such as gender and reparations and the prosecution of gender-based crimes. It provides concrete guidance to those seeking to implement gender-sensitive processes – informed by successes and failures in contexts around the world. 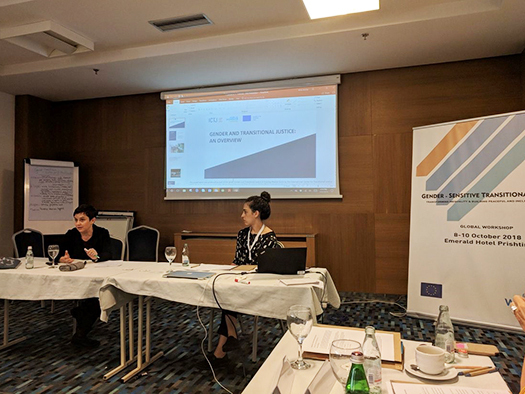 In October 2018, Muddell and her colleague Sibley Hawkins unveiled the modules in Kosovo as part of a workshop hosted by UN Women. Workshop participants – over 50 in all – included civil society leaders from Bosnia and Herzegovina, Colombia, Guatemala, Kosovo, Mali, Nepal, the Philippines, and Tunisia, as well as representatives from its funders, the European Union and UN Women. The modules have been carefully designed so as to serve as a flexible, conceptual framework for including gender in various processes, and not to dictate a prescriptive approach. The approach is practical, said Sibley Hawkins. “They present users with guiding questions to ask when designing and implementing transitional justice mechanisms, comparative experiences, and tangible advice for creating the conditions for an inclusive, context-relevant process,” said Hawkins. “In order to be truly victim centered and break with patterns of abuse and violence, gender measures must address the full universe of victims of conflict or authoritarianism,” she added.